This specimen, an adult female, was collected in the Patterson Building on The University of Texas at Austin campus in 1968, and placed in the systematic collections of Recent skeletons in the Vertebrate Paleontology Laboratory. This specimen was made available for scanning by Dr. Pamela Owen and Dr. Timothy Rowe of the Vertebrate Paleontology Laboratory of the Texas Memorial Museum of The University of Texas at Austin. Funding for scanning was provided by a National Science Foundation Digital Libraries Initiative grant to Dr. Timothy Rowe. The specimen was scanned by Richard Ketcham and Matthew Colbert on 16 March 1999 along the coronal axis for a total of 481 slices, each slice 0.0435 mm thick, with an interslice spacing of 0.0435 mm. To cite this page: Dr. Timothy Rowe, Ms. Megan Demarest, 2001, "Mus musculus" (On-line), Digital Morphology. 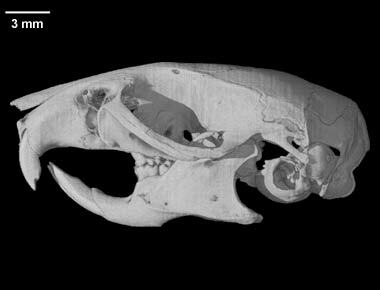 Accessed April 24, 2019 at http://digimorph.org/specimens/Mus_musculus/.